"Dear Caregiverlist, It took all of 20 minutes to get a job interview from this website. Thank you very much. Keep on putting your name out there because I know I am going to. I just moved to the California area and already I had an interview set up. You are changing lives." "Thank you for taking the time to explain the senior care options to me for Medicare, Medicaid and Veteran’s care. Having 2 parents needing care at once was an overwhelming process. I appreciated your kindness and industry knowledge. You were the only resource I found with actual costs for nursing homes and Medicaid." "We subscribed to Caregiverlist’s Job Applicant service and it actually worked! It has delivered a great ROI and helps us efficiently keep up with our staffing needs." From TheMiami Herlad article titled "The Need for In-Home Care Rises as Baby Boomers Age"
From U.S. News & World Report titled "How to Become a Savv Nursing-Home Shopper"
Many so-called "private-pay" facilities do not accept Medicaid patients, for example, but are included in the Caregiverlist ratings. Not every home responds to its outreach efforts, she notes. "The ones that we don't have the costs from [is because] it's mostly that they're 100-percent Medicaid." 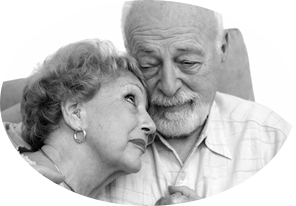 Become certified as a Caregiver! The video will give you an overview of our course which meets all industry standards. 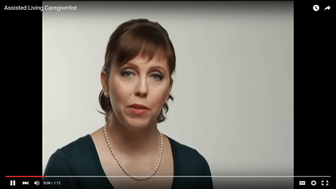 The video will provide an overview of the costs and benefits of senior home care. Lisa Sneddon, found of Senior Living Experts, provides advice on search for and finding assisted living options. Senior caregivers assist seniors as companion caregivers and nursing aides working in nursing homes, assisted living communities and senior home care agencies. Hospitals also hire certified nursing aides. 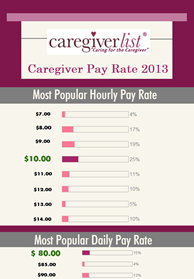 The pay rate for companion caregivers and nursing aides for 2013 has continued to rise and remains above minimum wage for all professional senior caregivers. Senior care companies hire from 3 to 6 professional caregivers each week, to keep up with the demand for part-time and full-time senior caregiving services. Most American seniors do not plan ahead for senior care and because of this, when a senior experiences a sudden medical condition such as a stroke, heart attack or the early stages of memory loss, they will then immediately need professional senior caregiving services. In order to keep up with the demand for senior care, the number of senior home care agencies has increased by 40% since 2008. 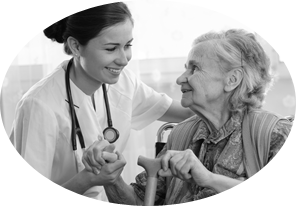 More than 20 franchise companies provide senior home care in addition to national corporations. More professional senior caregivers are needed to fill these open positions which increase daily. 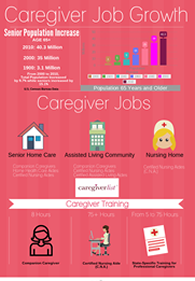 The ​Caregiverlist® Career Center assists anyone with a caring personality to learn how to become a senior caregiver and submit a job application which reaches multiple hiring companies in their area who subscribe to “the ​Caregiverlist®”. 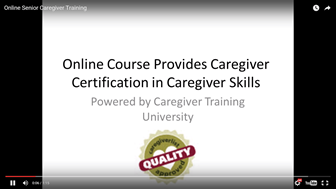 As the only resource with an ongoing database of experienced, professional senior caregivers, ​Caregiverlist® allows companies to efficiently hire the most qualified caregivers in their area.​ Caregivers may learn about required senior caregiver training and take an online course to learn the necessary caregiving skills and meet state requirements.